welp, we done SOLD OUT! 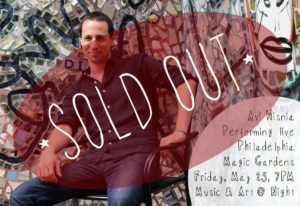 If you already got your tickets, i’ll see you at the Magic Gardens on Friday. including a full-band show JUNE 3 in Lawrenceville NJ. Posted Wednesday, May 23rd, 2018 under Uncategorized.